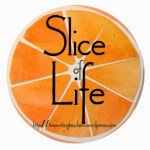 I am a teacher et cetera: Whatcha Reading? It's quiet. Occasionally I hear the plastic crinkle of a plastic-encased library book as a student flips the page. Brad is engrossed in Looking for Alaska. Alex, sitting next to him, is just starting to dig into The Handmaid's Tale. Alyssa picked up The Perks of Being a Wallflower just yesterday, and it already looks as if she is halfway through the book. I can tell from the expression on her face that she is deep into this story, empathizing with Charlie. My Independent Novel Studies students have just started our study of banned and challenged books, and our room is silent. If I break in now with some instructions, I know that I will get pushback. "This is a reading day, Ward." Let's read! And this is why I love March. 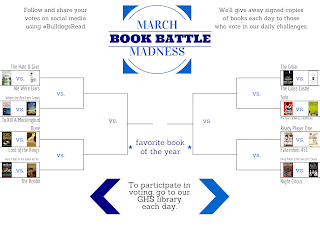 March brings with it our March Book Madness bracket, with students voting each day for their favorite books, pitting classics against contemporary YA novels, until one book reigns victorious just before our spring break begins at the close of March. 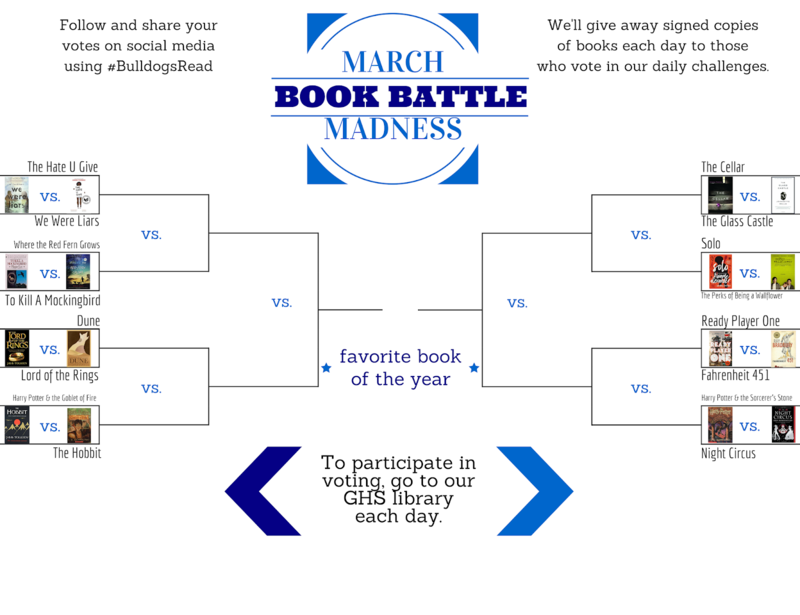 For students that vote, we are giving away signed copies of books each school day in March. The number of students that voted yesterday compared to today has already doubled, and it's only lunchtime. The school is buzzing with talk of books. Who will win today? To Kill A Mockingbird or Where the Red Fern Grows? Teachers have hung signs outside their doors declaring their current reading choices. 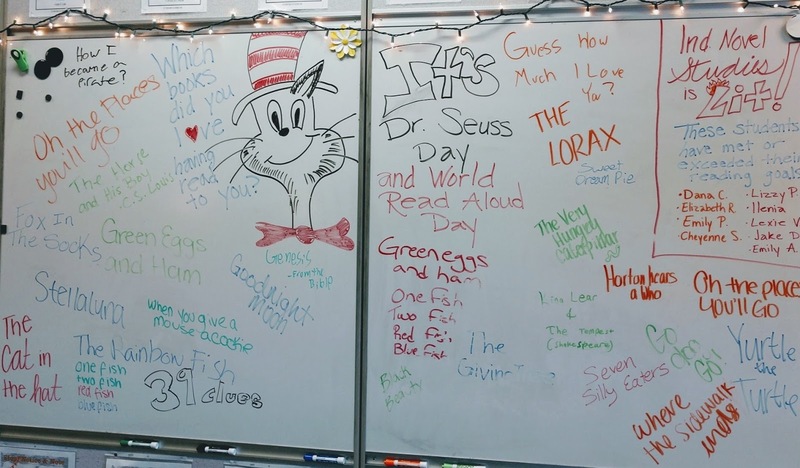 Students, high school students, are excited to share today their favorite titles for Read Across America Day. "My mom would always read that story about the nutbrown hair to me right before bed. What was the title again, Ms. Ward?" Guess How Much I Love You. "Yeah, I loved it. I memorized the words before I could read it." 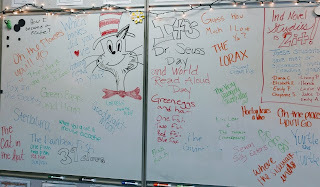 My students are readers. In part this is because our district has placed an emphasis on independent reading and choice, from kindergarten all the way through senior year. My students, whether AP-bound honors sophomores or struggling junior students, know that reading is a priority. They have grown up with books always at the ready. They have their regular reading days each week, when they are encouraged to dig in to a novel of their choice. And don't you dare try to take that time away from them. It is quiet now, not because they are bored or sleeping. It is quiet because we are all immersed in the pages of a good book. This is how you build a culture of reading. This is why I love March. Now, if you'll excuse me, I need to get back to my book.